Strong City is named after William Barstow Strong, the Vice President and General Manager of the Santa Fe Railway System in 1881. The city thrived due to the railroad and in 1913 the one story, pressed brick depot was built in the mission style, trimmed in native limestone and decorative brick with a tile roof. 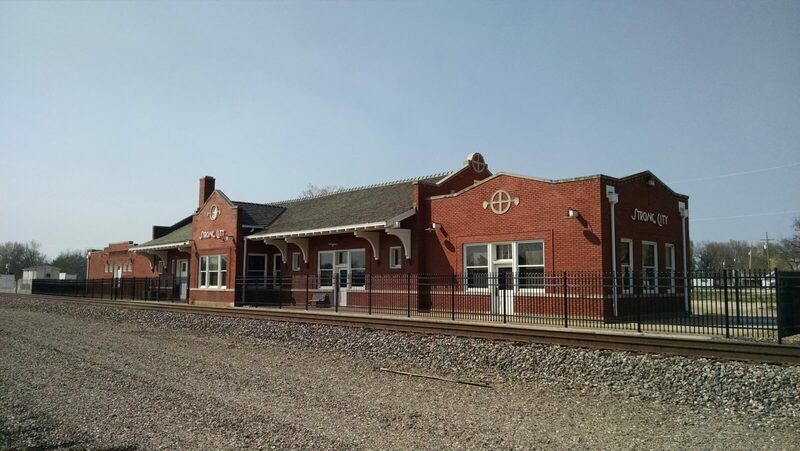 The depot has recently completed the main portion of the restoration with funds from a Transportation Enhancement Grant of $468,951 partnered with the city, a Jones Testamentary Trust, Wiedeman Foundation and two local families. Remaining funds were secured by providing tax credits. Work began in March of 2014, and now restored, the depot will not only be the home of railroad memorabilia but will also provide the opportunity to host meetings and events. The restored depot will also be the new site of the Strong City Hall as of Monday, August 14, 2015. The W.B. Strong Memorial Railroad Park is commonly called the Caboose Park and was established in 1997 through a matching ISTEA Grant from KDOT. The authentic Santa Fe Caboose is the main feature but it is surrounded by picnic tables, flowerbeds and walkways. This park has been adopted by the Chase County Girl Scout Troops and they assist in the upkeep of the flowerbeds and decorations for Halloween and Christmas. Local children converge to the park for the opening event of the Chase County Christmas. Christmas music abounds and a train conductor welcomes all. Once the “All Aboard” is called, the children climb the caboose stairs and receive a gift from Santa’s helper. The Girl Scouts hand out hot chocolate and cookies and one lucky boy and girl wins a large package of goodies donated by Valent Aerostructures.